I was a final year engineering graduate and my technical paper was selected for an international conference at Singapore for the first time. It was my first international trip, first international paper presentation and most importantly first flight. It was also my first trip alone without parents. 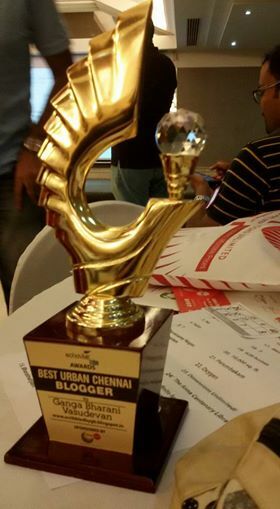 So one should understand how excited I should have felt at that time. My college sponsored my Singapore trip, my stay was planned at a friend’s place, so all I had to spend for was “Food”. I am a very choosy eater though I don’t look like one. I eat a lot if I like something and I starve if I don’t get stuffs that don’t satisfy my taste buds. There were times when I had even spent an entire day on water because I did not get anything that I liked to eat. Also, I don’t easily try new kinds of eatables. If I like something and I get it, I stay on with it. 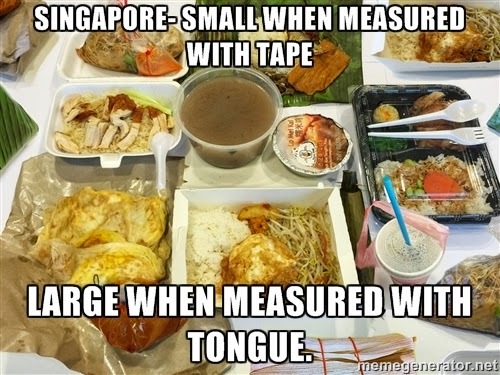 But when my trip to Singapore was planned my friends advised me to try the local cuisines. 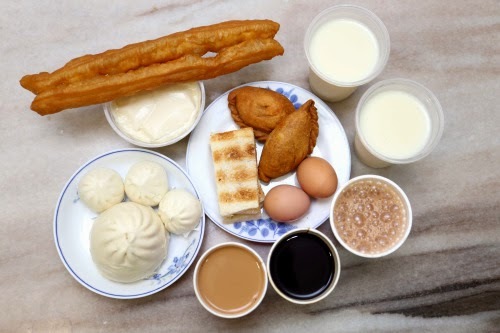 The first day of my stay in Singapore I restricted myself to the food that my friend had provided at her place. She was a wonderful cook of south indian dishes. I was little hesitant to try out the local cuisines at first. The second day I was on my own. I was roaming around Singapore in MRT. I loved the country so much and I loved the way it was connected so well with MRT even better. I got down at every station, walked around and came back to board the train to head to the next station. This is how I explored Singapore. I went to china town, little india, Clarke quay and kept roaming around. As I roamed my bag started getting heavier and heavier with stuffs I bought. I was on a mission of spending all the dollars I had in hand before I got back to my country. I was too exhausted when I was in a mall, I don’t remember the name of. I was at a Singapore restaurant at the mall when I was completely drained of energy. I decided to explore a little bit of Singapore food. Till then I never thought Singapore had such varieties. I had even skipped my breakfast so I decided to have a breakfast plate. 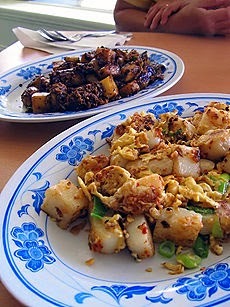 I looked at the menu and asked the super friendly person at the till what Chao Tow kuay was. She said it was carrot cake. I asked her if it was made out of carrot. She said it was named so but it was made with white raddish. I got curious and asked her how it was prepared. I got a reply that it was prepared by blending grated white raddish and rice flour; this is then steamed as pieces of cake. She added, then this is cut and fried in variety of sauces and spring onions are added. It tasted like heaven. It wasn’t too sweet as I had expected. I loved the dish and even tried the recipe at home. Then I had ordered Kaya Toast. The lady at the till suggested that I order Kopi along with it as the two get along well as a complete meal. I took her suggestion and ordered both. Kopi seemed similar as we call coffee as Kapi in tamil, my mother tongue. She, generously, explained that kopi meant black coffee and Kaya Toast meant a toast with a spread made of egg, sugar and coconut milk. The blend of coconut milk and sugar is always a heavenly feeling when it touches the right parts of the tongue. I loved the combo of Kaya toast and kopi o. For a tiring day as that was, Kopi was really refreshing and brought me back to my brisk self. I gulped down the curry puff that came along with the plate of Kaya toast. It was a small one but it had the right blend of ingredients to make it effectively small. teh Tarik, which is milk tea) was served at last with little spices added to it. I hadn't spent much to have a complete breakfast at this hotel. 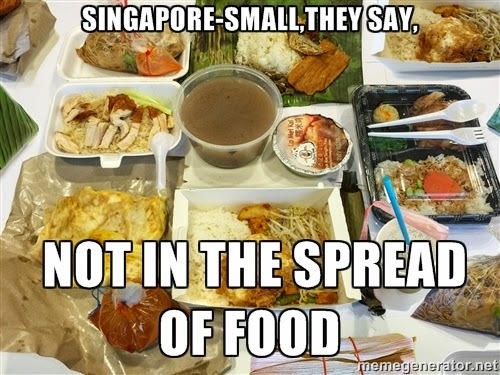 I loved the singaporeans taste for food. 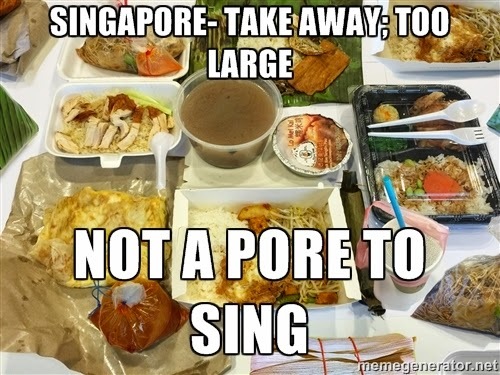 From then till now I long to go Singaporean while eating whenever possible. Written for http://discover.stayfareast.com/ contest conducted by indiblogger. Do you know about e-governance or Digital India? WashBucketChallenge: Challenge Accepted by Dad..!